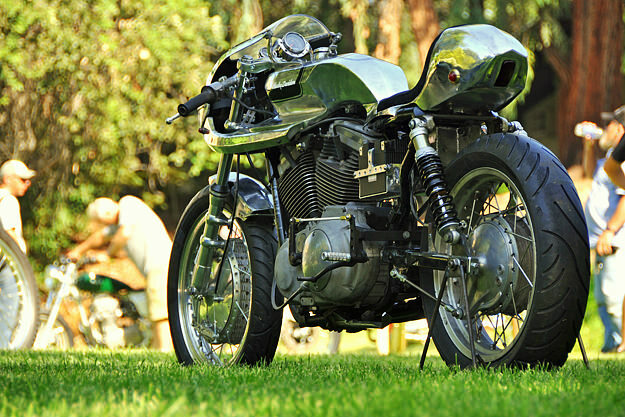 There’s a certain blacksmith shop feel to Shinya Kimura’s motorcycles, and I mean that in a good way. 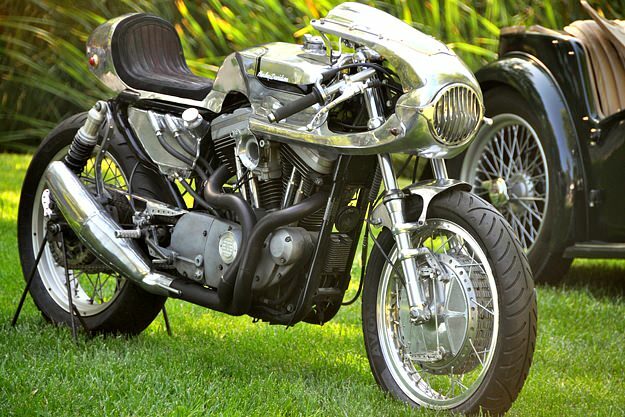 Looking at the bare aluminum bodywork of his latest creation, this cafe Harley Sportster, you get a sense of the heat and noise and sweat—the sheer effort and long hours—that went into its making. 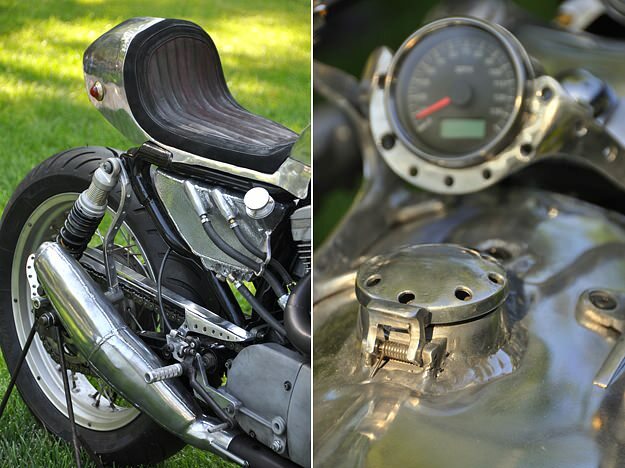 This is an all-metal motorcycle, and metal needs more than casual persuasion to take these shapes. That kind of all-in involvement lends an authenticity to Kimura’s customs that no amount of glossy paint or gleaming chrome-plate could ever bring. It has also led to a full order book with some very famous signatures on the ledger. Shinya doesn’t like to drop names, but I have no such compunctions. 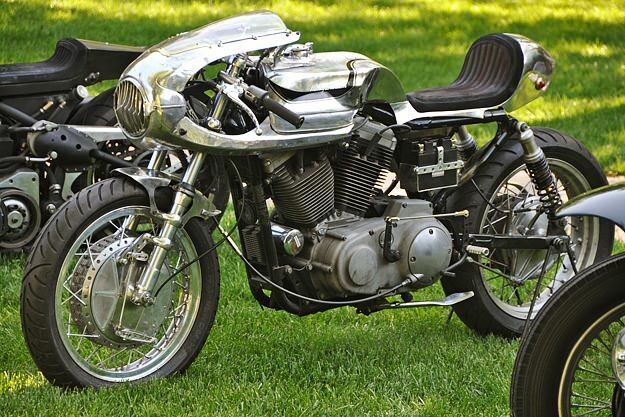 Actor George Clooney is a customer, as is Brad Pitt, who owns at least two of Kimura’s Zero-style bikes and a very tasty Ducati 750 cafe-racer. Likewise, Kimura does not discuss pricing, but assuming you’ve got enough coin expect a several-year wait before the project is handed over. I’m not sure who commissioned this cafe Sporty, but he’s getting a nice piece. It began life in 2003 as a 100th Anniversary edition. Kimura’s favorite bikes are roadracers from the 1960s and we see that influence in the 35mm Ceriani fork and Yamaha four-leading-shoe front brake. But it’s the fabricated alloy bodywork—fuel tank, fairing, fender and seat cowl—that gives the bike its Shinya signature, of course. 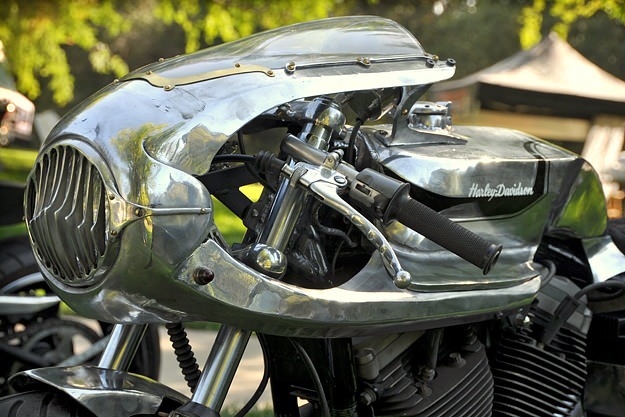 He leaves the hand-hammered aluminum in the raw with no filler, primer or paint to hide the many imperfections, attached to the bike with artful, asymmetrically carved brackets and exposed brass screws. Call it the flawed beauty of Shinya Kimura.